The past three months have whizzed by quickly, and I’ve been knee-deep in preparations for my son’s wedding on May 10. 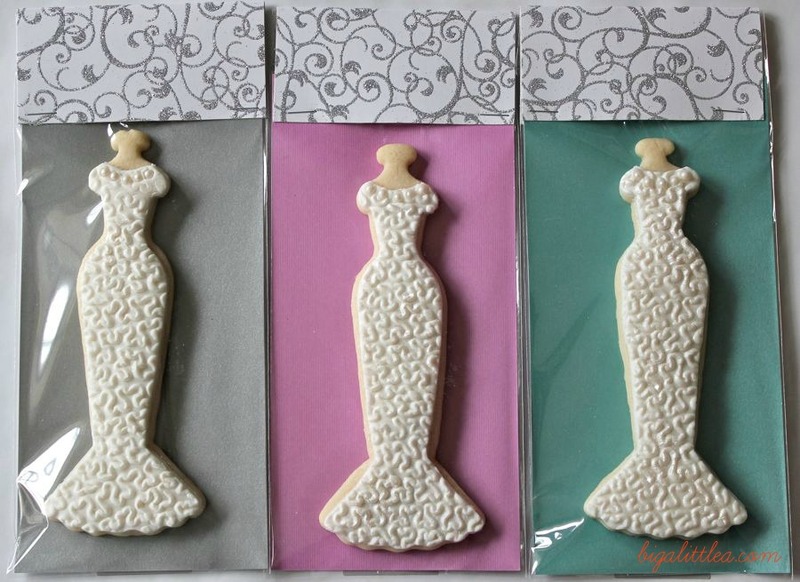 Aside from searching for a dress, and trying to starve myself a size smaller*, I managed to make these wedding dress cookies as a favor for the recent bridal shower. With the help of a gorgeous cookie cutter and some creative packaging, the presentation was awesome. I found this beautifully handcrafted copper cutter at ecrandal, a home-based business which features an extensive collection of copper cutters in endless sizes and shapes. 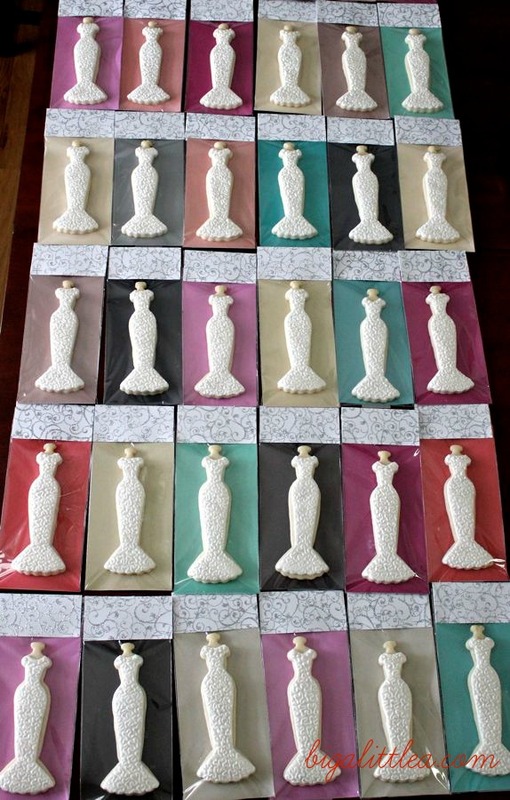 This dress is “Cindy’s Confection Collection, Style A” and measures approximately 6 1/4″ high by 2 1/2 inches wide. I was so enamored with the folks at ecrandal and their superior workmanship, that I have vowed to order a new cutter each month…that’s if I can keep it to just one! They are truly that beautiful. Now for the “cookie talk”. I am still loving the basic sugar cookie recipe over at sweet Sugarbelle’s. It’s so easy to work with and has great texture and taste. My next favorite is Satin Ice White rolled fondant. It rolls out easily and embosses beautifully. I found the small textured rolling pin on ebay several months ago. 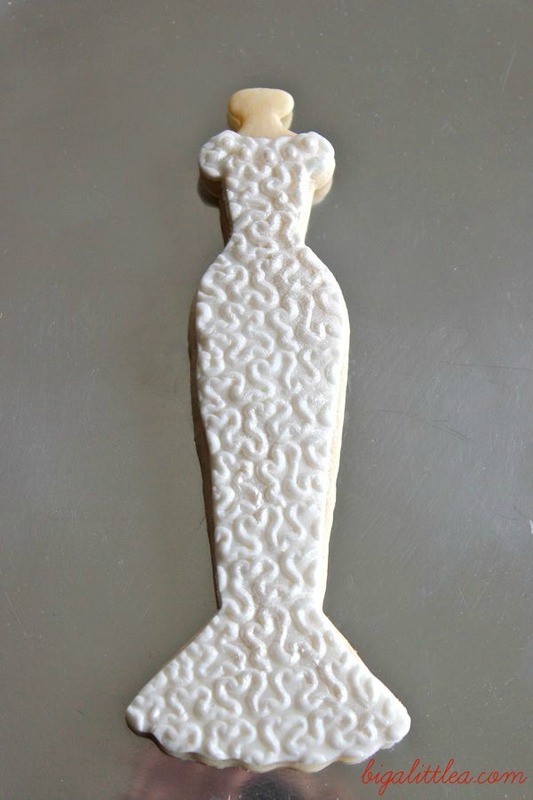 After the fondant was in place on the cookie, I piped five small dots of royal icing along the neckline and placed small sugar pearls on top of each dot. Brush on a little pearl dust, and the look is complete! *starvation does not work. the spanx website does. Amazing! Only you could show these beautiful cookies and say “easy” not once but twice. And the presentation — which we know is everything ; ) — is outstanding. I’m anxiously awaiting the next round of creativity from you and little a! They really are NOT as challenging as they appear, but thank you ;-) If you really want to see challlenging, check out sweetambs.com. A-mazing cookies there! They are so beautiful! GREAT JOB! Aunt Annie, these are incredible. You are simply amazing.